Saigon’s many cafes are a necessary and large part of the city’s unique culture. All over the bustling city, Saigonese start their busy days with a delicious cup of coffee. Saigon coffee is sweeter and less bitter than coffee from other regions around the country, making it the perfect drink for those travelers with a sweet tooth. A part of Saigon history is brewed into every cup of coffee made, and every visitor to Saigon must enjoy at least one cup before leaving the city. 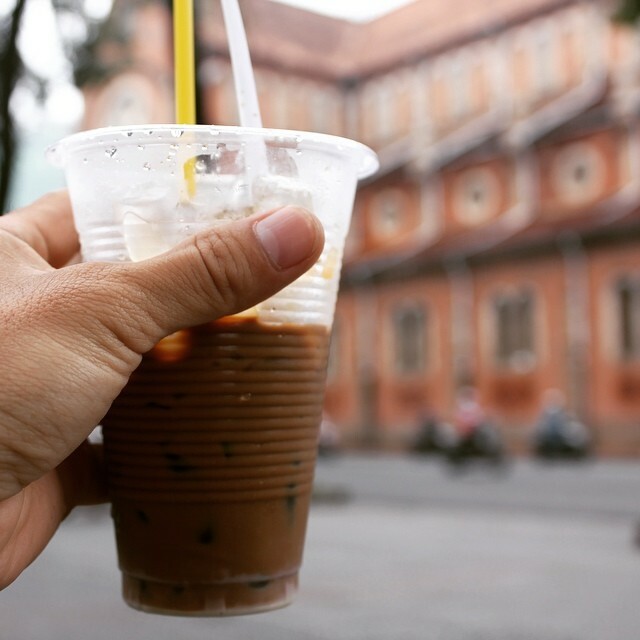 Here, five unique experiences that will turn every visitor to Saigon into a coffee connoisseur. 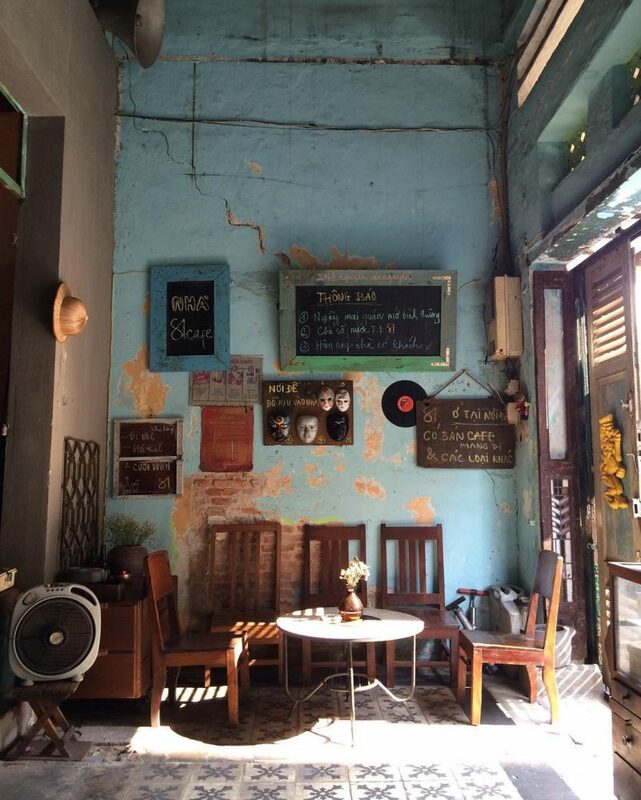 Oftentimes hidden inside old apartments, many of the cafes in Saigon are small, quiet, and sport a rather vintage look. There are no large signs indicating that visitors have arrived at the cafe they are seeking, and visitors might actually miss out on visiting some of them because of their relatively concealed locations. These rather inconspicuous coffee shops are normally decked out in vintage yet simple decor, making for an extremely laid-back atmosphere. There are two apartments that are equipped with a number of coffee shops we highly recommend. 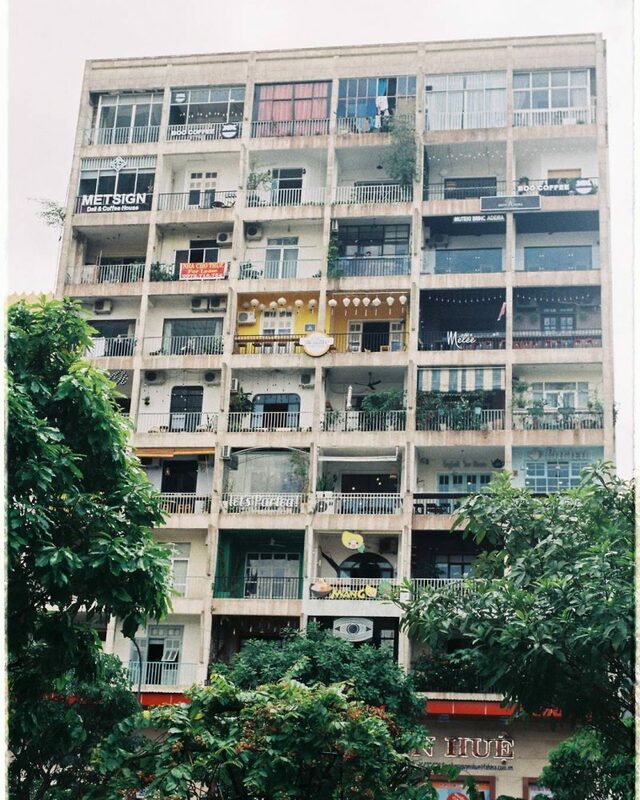 The Nguyen Hue Apartment was once used by naval officers in the post-war period after Reunification Day in 1975. The cafe is somehow able to keep a traditional Saigonese feel to it even though it sits in the center of an otherwise modern part of town. The number of coffee shops, fashion boutiques, and co-working spaces in the apartment seems to increase every month, so be sure to get here and explore before it is no longer a hidden gem. The Saigonese youth call this apartment “Vintage Mall.” The cafe gives off a mystic vibe, with unique and strange surprises behind every door of this unique venue. Cafes, bars, pubs, restaurants, fashion boutiques: this apartment seemingly has it all. One of the most noteworthy areas is the main hall, which is used as a gallery and is decked out in interesting artwork. Cafe “vợt” is a type of cafe that sells coffee brewed in a racquet, and there are only a few left in the city of Saigon. The baristas use a small racquet to brew their delicious coffee instead of a metal filter, which is what many Vietnamese coffee shops normally use. Its taste is not too powerful, but its memorable flavor will certainly make an impression on all those who drink it. Cafe “vợt” was once much more popular and was oftentimes referred to as the traditional coffee of Saigon. In the last half century, however, this coffee was gradually replaced by coffee made in a metal Vietnamese coffee filter. Very few shops still serve cafe “vot” in Saigon, and many of them do not have proper restaurant names and only serve their friends and family, making them hard places to find. Luckily for visitors, there are three cafes which still serve this famous type of coffee. This is the oldest “vot” cafe in Saigon, and it is over 77 years old. This coffee shop is owned by three single women who took the business over from their father. Cheo Leo Cafe is small and always packed with people. Crowds come here as early as 5:30 a.m. in hopes of grabbing a fresh cup of “vot” coffee. The next two cafes on our list of delicious coffee shops do not actually have proper names: they are so well-known by locals that their addresses have been dubbed their official names. 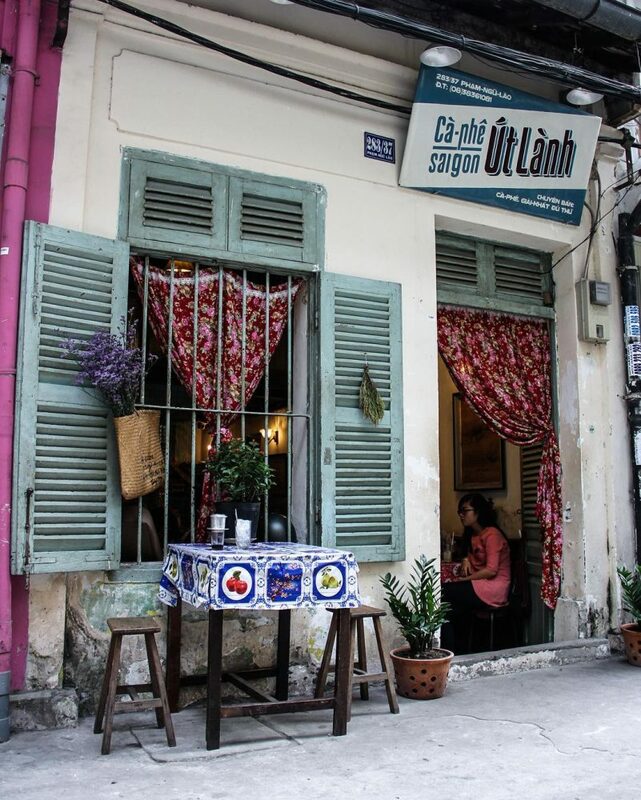 This cafe is over 60 years old and is tucked away on a quiet, small alley in Saigon. The coffee brewed here is kept in kettles, some of which are iced and others are kept in a coal stove for those who prefer a hot cup of joe. Those who gather here savor the taste of this excellent coffee atop plastic chairs, so feel free to pull up one of your own and experience the old taste of the city. 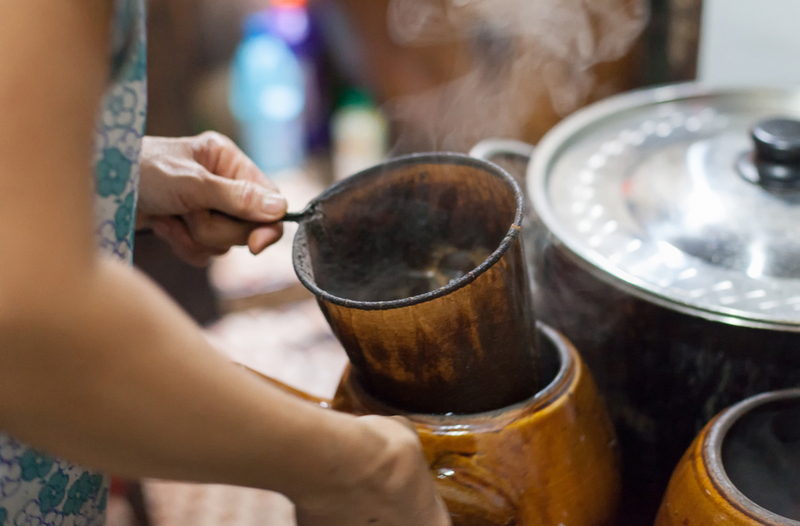 Mr. Thanh, the coffee shop owner, uses pottery to boil the water used in his delicious brews. He believes this extra personal touch makes the coffee taste even better than it did without his boiled water. 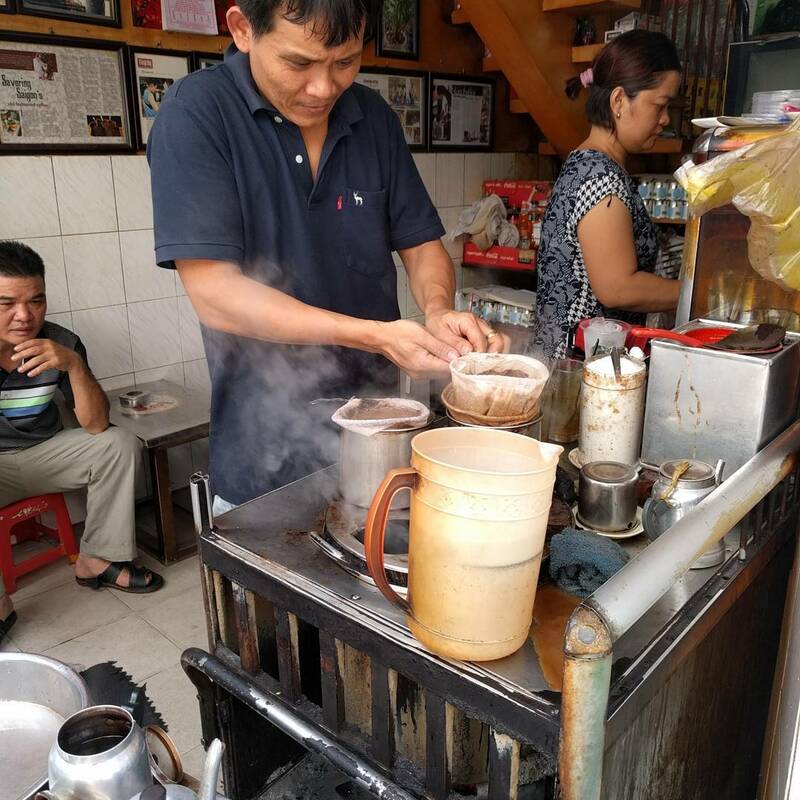 He has a good rapport with all of his customers and oftentimes serves many of his own friends, thus the price of the coffee is incredibly cheap: about 6,000 VND per cup. “Sitting-Plump” Cafe is an iconic coffee shop in Saigon. 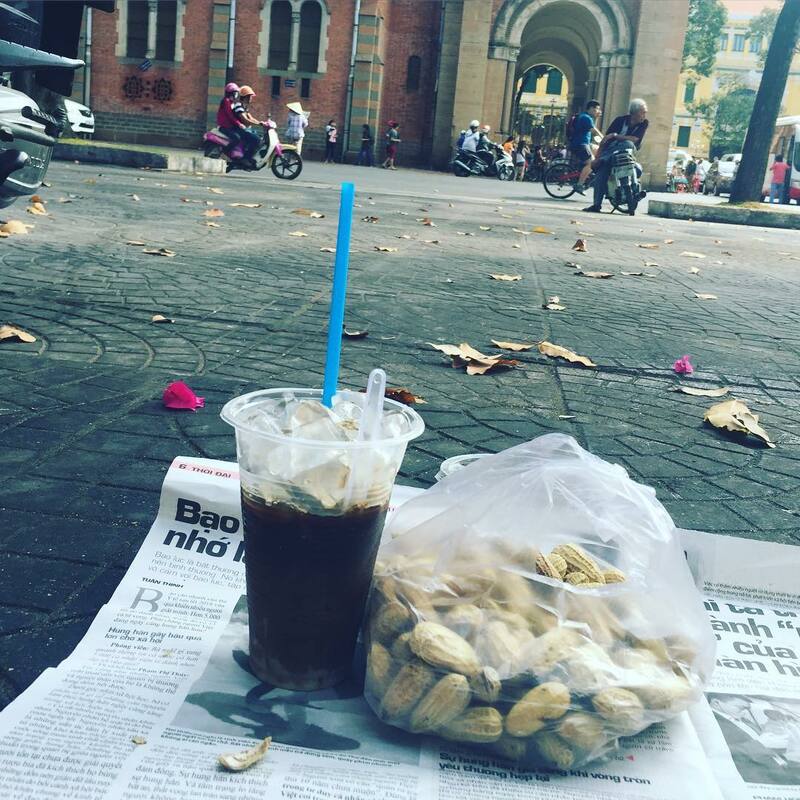 At the well-known April 30th Park (which is the actual name of the park) near the Notre-Dame Cathedral Basilica of Saigon, visitors will find students, workers, and even foreigners with a plastic cup of this cafe’s coffee in their hands. The price of each cup is incredibly affordable, with one delicious brew costing around 10,000 VND. Their menu is equipped with various drinks to choose from including coffee and lemon tea. Visitors can also purchase a number of different snacks here, from mango shakes to Vietnamese pizza and even boiled eggs. There is nothing like drinking a delicious cup of bạc xỉu, meaning iced milk with coffee, while observing the bustling city of Saigon. Visiting this cafe is simply a must for those visiting the city. Be sure to park your vehicle at Hoa Binh School, the City Central Post Office, or the Diamond Plaza before you go and grab a cup of coffee at the “Sitting-Plump” Cafe. 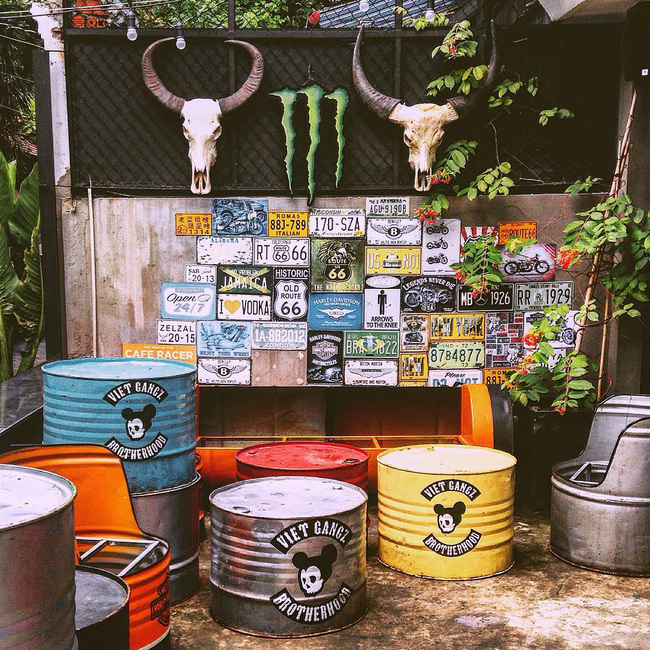 Saigon’s alleys are filled with unique finds. There are many of cafes found in these meandering streets that are certainly off the beaten path and are perfect places to unwind after a long day of exploration. The cafes are welcoming, uniquely decorated, and every visitor to Saigon should try at least one of these quaint coffee shops before leaving the city. Here, some of our favorite alley coffee shops you need to try. 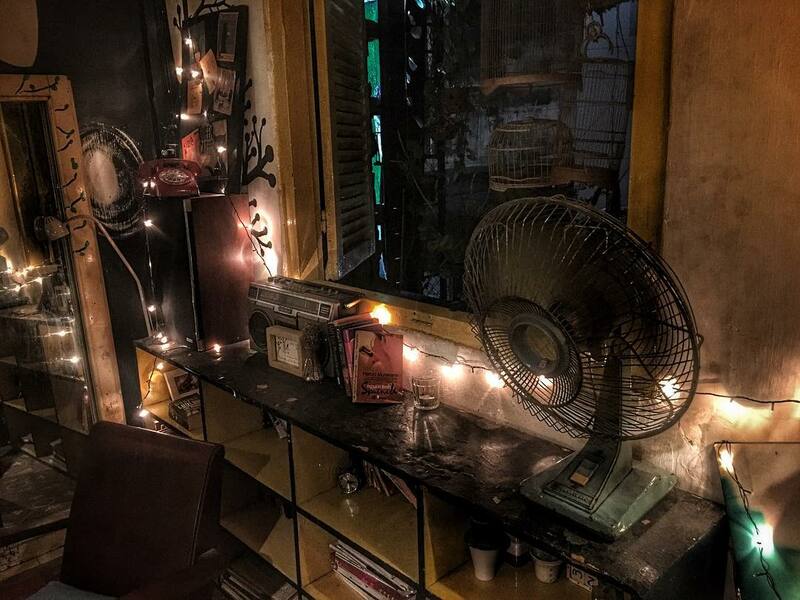 One of the most Instagram-worthy of cafes in Saigon is VietGangz Brotherhood, with enough unique decor to keep visitors snapping photos for the entirety of their visit. This cafe is filled with Buddhist relics. 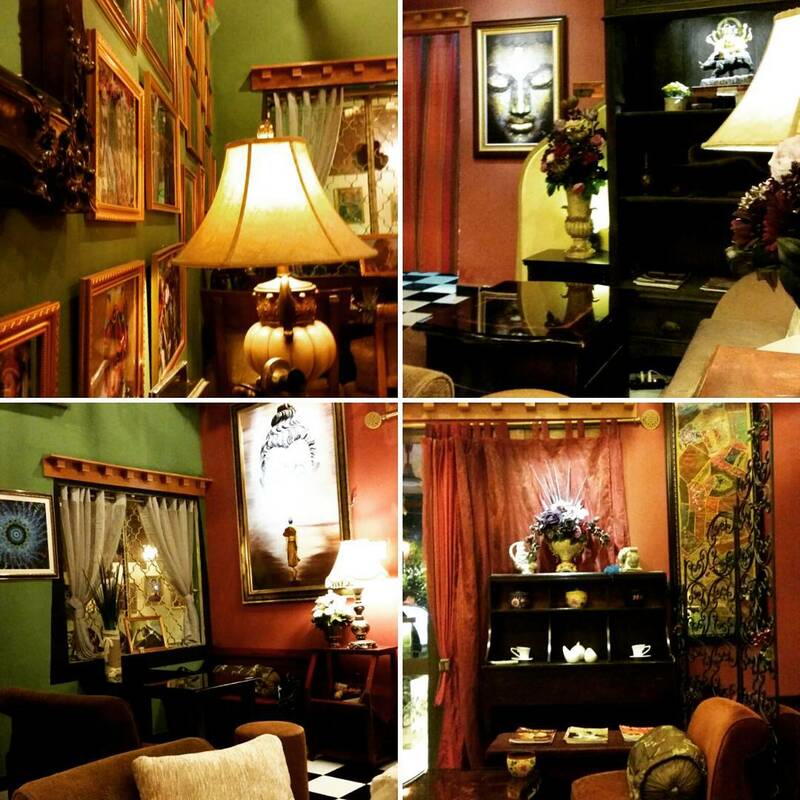 Visitors will also find Tibetan artifacts decorating this remarkable cafe. There is also an area designated for those visitors who want to meditate, and meditation classes are held here each week. Those looking for a tranquil coffee experience need to head to Oromia Coffee. The coffee shop is found in an extensive green space embellished with trees and equipped with a pond filled with koi fish. It is also well-known for its unique decor. Saigon has a number of cafes that channel the 1990s for their epic furnishing, laid-back vibes, and cool retro feel. These Saigonese-style, vintage cafes are not to be missed by those who visit the city. Here, our favorite cafes that take visitors back in time with their specialty brews and cool decor. Ut Lanh Cafe sits inside a 90s-style home. It is decorated with vintage decor, and the coffee shop even lacks wifi. Fret not, as those who frequent this cafe can sit down and really enjoy their cup of brew in addition to good company without having any technological distractions. Those who go as far as to not use their cell phones even get a 5,000 VND discount, as well. The drinks at 81 Cafe are made with homemade recipes with hints of many of the most delicious traditional Vietnamese drinks in their make up. The cups of joe here will surely make locals feel nostalgic and impress all those who visit. Abracadabra Cafe sits inside a historic villa that was renovated to house the delicious coffee shop. Saigon’s many cafes are some of the top destinations in the city. New coffee shops continue to open, each one seemingly more unique than the last. In order to find the best brews in the city, a local insider is needed as many of these shops find themselves in the most inconspicuous of places. Inspitrip offers several experiences which include a cup of joe on the itinerary in addition to sightseeing and visits to some of the top attractions in town. Be sure to check out our Ho Chi Minh City experience by bicycle or our exclusive coffee journey for those with a need for caffeine. Hi there, i need your assistance. The Cafe Bệt – “Sitting-Plump” Cafe is located at the April 30th Park and near the Notre-Dame Cathedral Basilica of Saigon. But when i try to search for the April 30th park, it is located at the far north of HCM – Ba Mươi Tháng Tư, Phường 3, Tây Ninh, Vietnam. Beside the Cathedral is the park-Thong nhat park. Zen: Actually you may search on google as “30/4 park saigon” or “30-4 park” because there is actually a park named “April 30th park” at the address you found. Historically, April 30th is our Independent Day and Independence means “Thong nhat”, so the park near the Cathedral is either “30-4 park” or “Thong nhat park”.